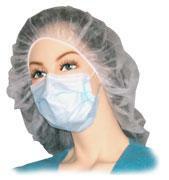 Earloop mask is cool and made of nonwoven, pleated, glass free nonlinting materials. The nose piece is enclosed to ensure safety. Floss covered earloops allow swift easy donning.